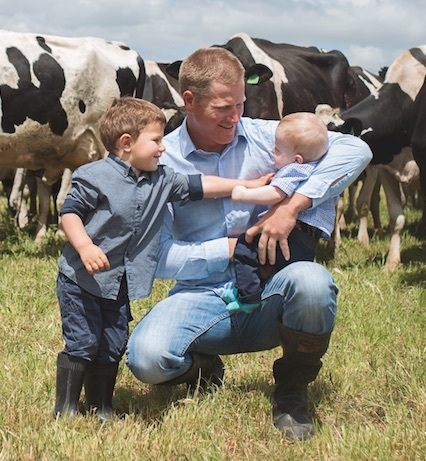 Tongala dairy farmer Scott Fitzgerald has always had a passion for dairy farming. But never in his wildest dreams did he think he would lead the agenda for the nation’s dairy sector. ADC Melbourne 2018 kicks off in two weeks, 13-15 February 2018, with a program orchestrated and coordinated by the local farmer in his role as 2018 Programming Committee Chair. Leading a team of 12 dairy enthusiasts, Scott and his colleagues have pulled together a stellar program containing global and national dairy minds, innovators and progressive farmers to challenge and foster thought-provoking conversations for Australian dairy farmers. Almost 400 dairy farmers from around the country are expected to attend. Mr Fitzgerald milks 300 cows on an irrigated, pastured-based farm at Tongala, supplying A2 milk to Ky Valley Dairies. He and his wife, Anna, lease the farm from Mr Fitzgerald’s parents. Mr Fitzgerald is promising a unique program with something special for the younger farmers in attendance. He said he first attended the Australian Dairy Conference in Tasmania in 2015 “just out of interest” as he had never attended any sort of dairy conference before. “The inspiration that I came away from it with was terrific,” he said. Upon their farm return, he and a friend were so inspired they set up a discussion group in their district. Mr Fitzgerald said the conference provided a great opportunity to see farms in other parts of Australia. But it was a lot more than that – as it helped create a different mindset when looking at his farm business. It was also great to network with other farmers.“People are there for the same reason,” he said. Mr Fitzgerald said taking on the Programming Committee Chair role was also a personal challenge and one he hoped would lead to other opportunities in the dairy industry. “Sometimes in life you have to push yourself – and this is one those moments,” he said. “The conference is organised by farmers for farmers and is completely independent, which gives the programming committee open charter on any issues they feel are relevant to the dairy industry,” he said. Mr Fitzgerald said that there is also a strong emphasis for Melbourne 2018 to encourage younger farmers to attend to realise the value in networking, gaining knowledge and mixing it with some of the best dairy minds in Australia and beyond. “A focus this year has been on attracting younger members of Australia’s dairy community to involve themselves with ADC. I attended for the first time only a few short years ago and look where that involvement has led me to today – I never would have imagined the possibilities or people I have met,” he said.